Give your home that vacation feeling all year round with a beachy keen bathroom. From soothing color schemes to tropical wallpaper these examples plucked out of many of our favorite beach houses on both the east and west coast will inspire you to create a beach-inspired washroom — 90-degree temperatures and an ocean view are not required. New York based, Chango and Company decorated this bathroom in a beach bungalow located in Bay Head, New Jersey. The blue, patterned paisley wallpaper resembles large drops of water. An antique wood mirror over the sink reminds us of a ship's porthole. On the wall are two custom drawings. One features a lobster; the second is of an octopus wearing an 18th-century diving helmet. The wood floor contributes to the bathroom's retro appeal. Our favorite features in this beach house bathroom by My Younique Designs situated in San Antonio, Texas are the colorful wood tile backsplash and the giant crab wall hanging. Both features splash on the whimsy. The walls are white shiplap. Marble bricks cover the shower stall. On the floor are porcelain planks that resemble natural wood. The three clerestory windows over the vanity fill the space with natural light without sacrificing privacy. Just like the color blue, green can also give a bathroom a breezy beach vibe. This example by Crowell Interiors situated in Nashville, Tennessee, is brightened up with wallpaper in an abstract fern pattern. The gorgeous wood framed mirrors lend elegance to the beach house bathroom without feeling too formal. Capturing the spirit of summer's past is a vintage photo of a person preparing to dive into a pool. IDF Studio situated in San Francisco, California gave this small bathroom a seaside twist with several accessories. A wave pattern shower curtain sets the soothing color scheme. An unfinished wood medicine cabinet is a rustic touch that adds natural contrast. Above it is a reproduction of an antique nautical lamp. The base cabinet was painted Maritime Blue by Benjamin Moore. For an extra dash of coastal charm, a metal lobster trap gets a new life as towel storage. If you live in the northeast, ​then you know nothing exudes a coastal feel like this lobster pattern wallpaper called Lobby by Abnormals Anonymous in a washroom by New York interior design firm, Chango and Company. The marble-topped vanity is a luxurious touch that offsets the whimsical wallpaper with a splash of sophistication. Two mirrors wrapped in rope enhance the room's seaside look. Taking center stage is a window placed high enough to allow in light while maintaining privacy. Shibori striped wallpaper signifies the ocean in this powder room by interior architecture and design firm, Studio 80 out of Eagle, Colorado. Overhead is a polished metal Hicks Pendant light hanging from a plank ceiling. The retro pedestal sink features bright nickel fixtures. On the wall is a large round brushed metal mirror. This bathroom by New City based firm, Threshold Interiors, captures the essence of the beach by evoking coastal charm with a few well-chosen decorative features. Covering the upper walls is wallpaper by Farrow & Ball in an abstract wave pattern called Aranami. Below the wallpaper is white subway tile. The hamper is a handwoven basket from Africa. The penny tile floor feels like smooth, soft beach pebbles underfoot. The bathroom vanity with ample cabinet storage has a Carrera marble topper. A beach house in Anna Maria Island, Florida gets a sultry new look thanks to Crowell Interiors out of Nashville, Tennessee. Here the child's bathroom gets a tropical lift with jungle-inspired wallpaper, and a vanity and mirror set both painted Teal Ocean by Benjamin Moore. You do not have to stick to a blue color scheme to create a nautical-inspired bathroom. In a beach house in Chandler Bay on the coastline of Barbados, Florida based architectural firm, Geoff Chick Associates installed a pristine white master bathroom. The wall-mounted ceramic coral light fixtures are a wink to the home's oceanfront. The tile floor in a neutral shade of beige is a nod to the sandy beach directly outside. Topping things off is the ceiling painted a shade that resembles sea glass green. Pebble tile in the shower creates a beachy effect in this small white bathroom by Cynthia Hayes, an interior designer based in Providence, Rhode Island. You can purchase stone pebble mosaic wall and floor tile in a range of natural colors at most home improvement stores for up to $10 per square foot. The team at True Design Studios out of Jacksonville, Florida struck the perfect balance between modern style and coastal cool when they created this white bathroom. The round Sailor's Mirrors (you can buy similar ones at Anthropologie) are a seaworthy touch. The dune grass in the vase on the left adds a pinch of natural greenery. Covering the walls are porcelain tile planks. You can swim with the fishes in a good way courtesy of a patterned wallpaper like this one shown in this beach house bathroom by Blackband Home and Design in Costa Mesa, California. Adding to the room's vacay feeling is bathroom vanity that resembles a vintage steamer trunk. The textured wall above the sink is mother of pearl wall tile. The porthole mirror has an antique copper finish. Our favorite touch is the chiseled stone sink, which adds rugged contrast to the polished space. 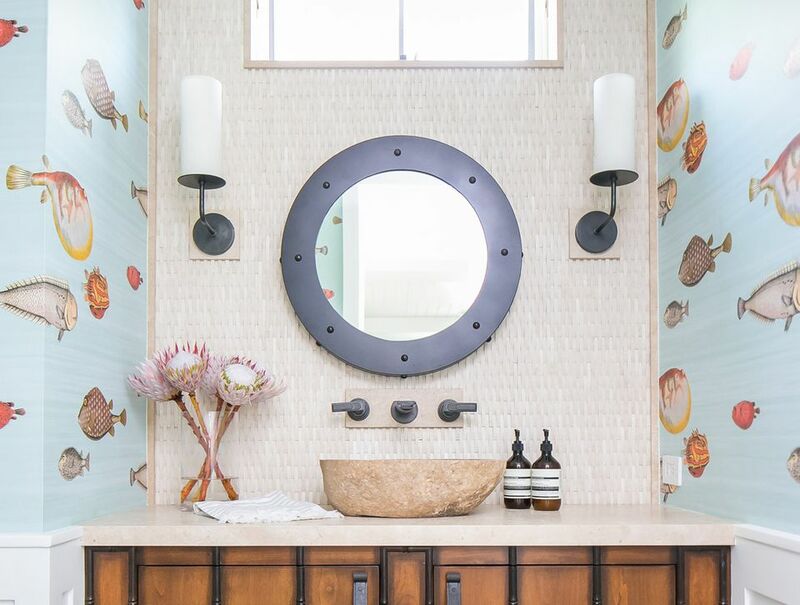 We promise that the jellyfish in this beach house bathroom by Amy Johnson Interiors, out of Ponte Vedra Beach, Florida will not sting. The wall tile was custom made for the client. AKG Design Studio, based in La Jolla, California created this beach theme bathroom. Turquoise glass tiles in the shower and around the sink set the seaside tone. Starfish art on the wall is a cute accent that enhances the bathroom's breezy feeling. A bathroom bathed in shades of blue by Noelle Interiors gives us the beachy feels. Our favorite feature in this space by the design firm based in Manhattan Beach, California, is the cool, blue penny tile floor in the shower.